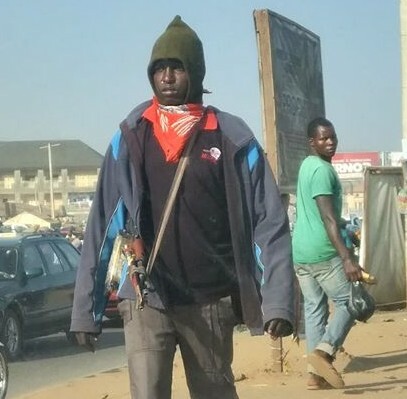 A Nigerian man, Olumide Olaniyan, has raised alarm after spotting another man believed to be a civilian, pictured above, roaming the streets in Nyanya, Abuja with an AK47 hung on his body. I was tempted to go ask him about his ID card and why he was such a psychological violence to onlookers. Then, I remembered Maama Sunde's counsel those days I used to do student activism at the University of Bariga, "ma se subolation si oro oloro, [don't interfere in other people's matter, face yours]". I felt that it is my business to ensure that there is safety and security in the land. I felt like questioning this dangerous looking man, on behalf of Nigeria. But, my sense talked to my brain, they both forced me to drive on. I will never know if the man is a vigilante, or a state security personnel. That certainly was not a Dane gun. That clothing was not a security personnel uniform. An undercover agent won't expose himself with an automatic gun in public. 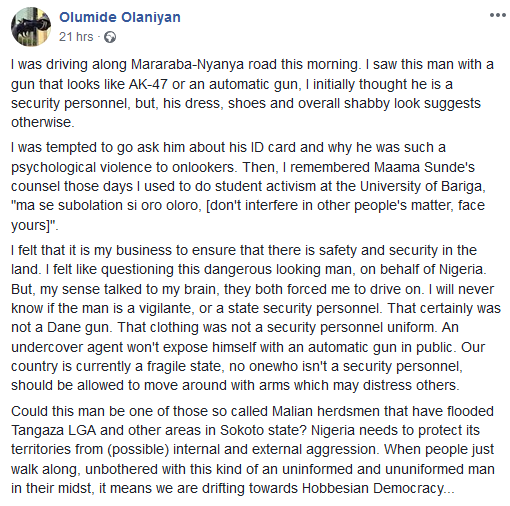 Our country is currently a fragile state, no onewho isn't a security personnel, should be allowed to move around with arms which may distress others.